and to this day it is still the classic treatise on the subject. In 1589, Pope Sixtus V chose Bellarmine as theologian to accompany the papal legate to Paris to help negotiate new treaties with France. Pope Clement VIII chose him to write the preface of the new edition of the Vulgate. In 1592 he was made rector of the Roman College. 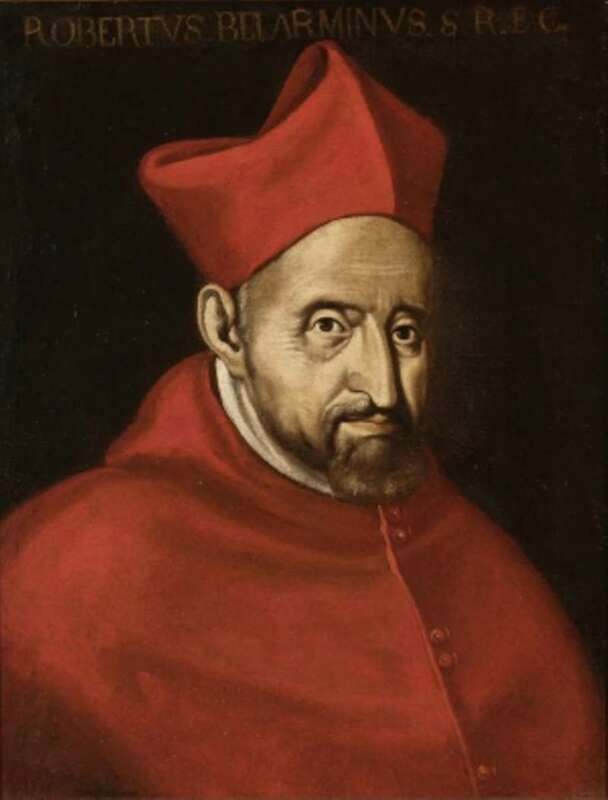 By 1599, Robert Bellarmine had been made cardinal and a Cardinal Inquisitor. He wrote strongly against non-residence, that is, a bishop not residing in his own diocese, a widely accepted practice at the time. When made archbishop of Capua, he left within four days for his diocese and devoted himself to his new duties. Robert Bellarmine is noted for his work during the Counter-Reformation in which he implemented the decrees of the Council of Trent. He was famous throughout all of Europe as a theologian and as a strenuous defender of the Faith. His prolific writing included works of instruction and devotion. During his retirement he wrote several short books intended to help ordinary people in their spiritual life. An autograph of St. Robert Bellarmine, Confessor and Doctor of the Church. 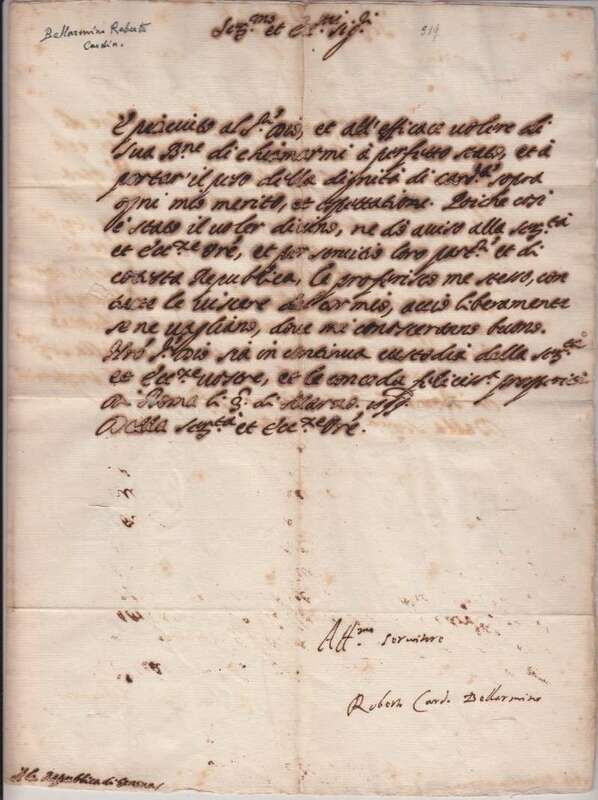 The letter, dated 1599, is signed, Robert Cardinal Bellarmine. He was very influential in the Counter-Reformation. He was a brilliant cardinal who played a role in the Galileo affair in 1616. Pope Pius XI canonized him in 1930. Robert Bellarmine died in Rome on September 17th, 1621, at the age of seventy-eight. Pope Pius XI beatified him in 1923 and then canonized him in 1930. In 1931 he was declared a Doctor of the Church. He is buried in the Church of Saint Ignatius, in the chapel of the Roman College next to the body of his student, St. Aloysius Gonzaga. Bellarmine, on behalf of the Holy Office (today the Congregation of the Faith), had to admonish Galileo for teaching the heliocentric theory, which claimed that the sun and not the earth is the center of the universe. At the time, the thought was that the heliocentric theory was contrary to the Scriptures, so the issue became problematic when Galileo, a scientist, started to make theological claims. The Galileo controversy is one that many anti-Catholics cite when they want to attack the church as anti-science or to claim that the church is not infallible as it claims. A little knowledge of history easily dismisses both claims.